Probably one of my favorite things about being self employed is the freedom that it gives you when you think about how you spend a day. The pressure is always on, but luckily if I have a computer and wireless connection I can pretty much spend my day anywhere I want. So, I am always looking for unique places where I can relax outdoors and work while smiling politely to the ladies in suits who are clearly rushing through their lunch in the time clock crunch. I don't miss those days at all. Check, Check, Check and Check! Some other non-work related highlights: a Mimosa Club, Fantastic Brunch and lots of yummy wine! In fact, it is one of my secret hiding spots on Fridays around 4p...my friend Diane and I spent all summer last year stealthily meeting to kick off the weekend early. As I tend to do when I find something I like, I usually order the same thing....it is so good and healthy and I crave it. It is the La's Chicken Salad Salad. 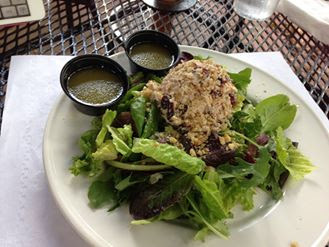 The chicken salad has little mayo and nuts over spring greens and a honey vinaigrette that is to die for. What is always a nice touch is that one of the two owners (they are husband and wife) usually stops by and sees how my meal was. Really happy to spend time and energy at a place that cares about their people.